The 1976 discovery of a unique fossil below west-end Bloor Street tells us that an extinct and little-known deer once called Toronto home. Mammoths, mastodons, and giant beavers! Prehistoric Toronto looks back—wayyyyyy back—and explores the terrain that is now Toronto, as it developed through the ages. The Torontoceros likely looked something like the caribou. On November 21, 1980, the TTC flung open the doors of its brand-new Kipling subway station, at the end of more than one-and-a-half kilometres of new track extending west from the Bloor-Danforth line’s previous terminus at Islington. More than four years earlier, among the earth excavated to bury sections of this track, a member of a TTC construction crew found something unique. On April 12, 1976, Horst Templin recovered a pair of antler fragments protruding from a fossilized skullcap just west of Islington station, below the spot where the railroad tracks pass over Bloor Street. The fossil—which was subsequently donated by the TTC to the Royal Ontario Museum—made its way into the hands of the ROM’s C.S. Churcher and R.L. Peterson for study. In 1982, they published their findings in the scientific journal Quaternary Research. While they acknowledged the possibility that what they had was simply a “wildly unusual antler conformation in an already recognized genus,” they called the Toronto subway deer Torontoceros hypogaeus: the genus name for the city built on the animal’s ancient home, and the species name a combination of the Greek “hypo” (below) and “geos” (earth), a reference to the animal’s subterranean discovery. While very little about Torontoceros is knowable on the basis of just the one fossil, Churcher and Peterson were able to come to a few more conclusions. 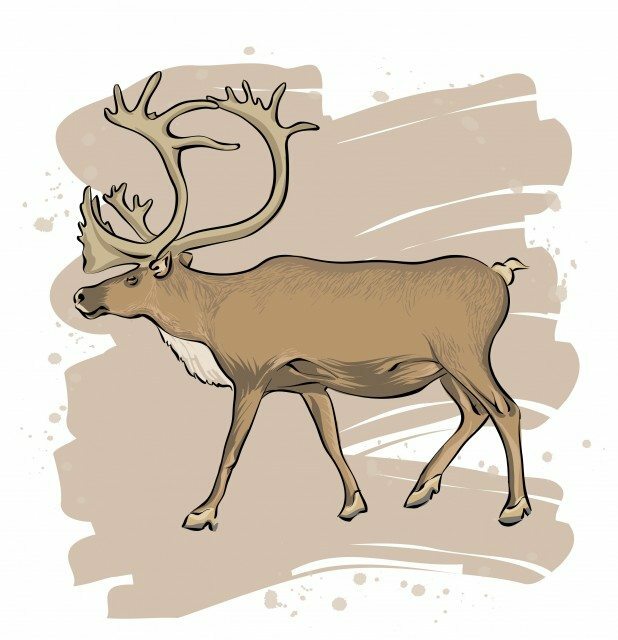 Torontoceros, they wrote, was “a medium-sized deer with disproportionately heavy antlers,” probably like a slightly smaller caribou. Damage to the surface of the antlers of this particular Torontoceros suggests that it died in the spring, when its antlers were still in velvet, and not yet fully developed into bone. Pollens found preserved in the sediments nearby show that during its life it roamed through mixed forests of both hardwood and coniferous trees. Radiocarbon dating on the fossil put it at roughly 11,315 years old, meaning that this Torontoceros lived and died in the immediate aftermath of the draining of glacial Lake Iroquois, and likely coexisted with the giants of the Pleistocene epoch, the mammoth and the mastodon. Torontoceros might also have coexisted here with humans, and was perhaps hunted by them. There are many theories as to how humans first arrived in the Americas. Conventional wisdom has early settlers crossing over the Bering land bridge from Siberia after the retreat of the last Pleistocene glacier. But many archaeologists now believe that crossing happened earlier, and that humans inhabited the Pacific coast before the end of the Ice Age, maybe as many as 20,000 years ago. One theory, advanced by the Smithsonian Institution’s Dennis Stanford, has early Europeans making their way across an icy Atlantic Ocean by boat. In what is now southern Ontario, the story is considerably less complicated. As the land became deglaciated, nomadic hunter-gatherers gradually began to appear in very small numbers, about 11,000 years ago, presumably in pursuit of migratory animals who came here. In 1908, 68 years before Torontoceros was unearthed, a different construction crew, tunneling more than 20 metres beneath Toronto Harbour, discovered footprints preserved in a layer of underwater clay. The crew, not realizing the significance of the footprints, destroyed them. They may—if authentic—have been a record of some of the first human steps ever taken here, when the water level in Lake Ontario was well below today’s. People had arrived in Toronto. The rest is history.